Last month, PRI’s South Caucasus office conducted training in Armenia for members of Armenian and Georgian National Preventive Mechanisms (NPMs) on the monitoring of psychiatric institutions. Independent police and prison monitoring boards operating in Armenia also attended. The training, which was led by Vladimir Ortakov, a psychiatrist and former member and Vice-President of the Committee for the Prevention of Torture (CPT), aimed to enhance the knowledge and skills of those who undertake monitoring in psychiatric institutions, and included a demonstration visit to Nubarashen Psychiatric Hospital in Armenia. 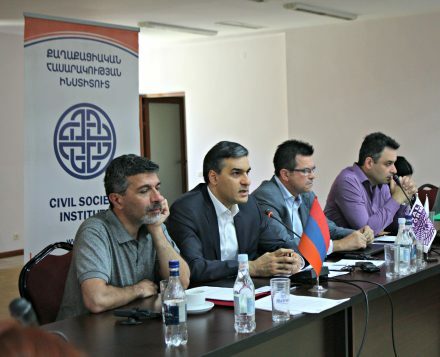 The workshop was held within the framework of a PRI project, ‘Reducing torture and ill-treatment through strengthening preventive monitoring mechanisms in Armenia and Georgia’, which is funded by the Netherlands’ Ministry of Foreign Affairs and implemented in Armenia with partner Civil Society Institute (CSI). The project aims to strengthen the legal and normative framework of monitoring bodies in Armenia and Georgia, build the capacity of NPMs through training workshops and resources, and highlight the importance of monitoring as a form of torture prevention. PRI has a number of resources to support monitoring bodies, including the Detention Monitoring Tool, which contains a number of thematic papers and factsheets that provide practical guidance to help monitoring bodies conduct effective visits to places of detention. Find out more about the work of PRI’s South Caucasus office.